Yesterday I was working on my article about William Thornton, who I believe to be my 4th great grandfather. His parents are said to be James and Elizabeth Jenkins Thornton. Nothing is known about Elizabeth other than her name. In 1740 when James sells some land in Massachusetts his wife had to cosign the deed. She was unable to write so some else wrote her name down and she made her mark. Her name was the very unusual Ketiran. Elizabeth had presumably died and James had remarried. Okay, so in colonial times, many people used very distinctive naming patterns for their children. The first son was usually named for the father's father, the second son for the mother's father. The first daughter was named for the father's mother and the second for the mother's mother. Then the parents would name children after themselves. If the children of James Thornton all shared the same mother and her name was Elizabeth, her name is conspicuously absent. Each of James' children named a son James. Most of the children named a child for themselves and their spouse. Only William named a daughter Nancy, said to be the name of their grandmother Thornton. (Error note: William did not have a daughter named Nancy, this was a transcription error) There were four daughters named Mary and three named Catherine. Agnes named her first daughter Catherine. What if Ketiran was really a mangled spelling of Katherine? This makes a lot of sense to me. Unlike these days when all manner of made up names are used, the folks of the 18c. used well known names. Ketiran is not a name seen anywhere else. What do you think? NEWS FLASH 24 July 2015: I have found some new information on Katherine Thornton!!! I think that it is pretty clear from the first two instances, her name was Katherine. Only in the last one is it spelled Ketiran. I have run these three names by many people and they all agree that the intended name must have been Katherine. I also believe that it is highly likely that the mother of at least some if not all of James' children was Katherine. If Katherine was not their mother, then I would put a bet on the Mother's name being Mary. The total lack of grandchildren named Elizabeth, is to me, a strong indication that James' wife was not an Elizabeth. Okay! Found her name once more in a deed and I think this one, if you aren't already convinced, will seal the deal. Today is a great genealogical day for me, possibly the best. I have been struggling with my Thornton ancestry almost from the beginning. 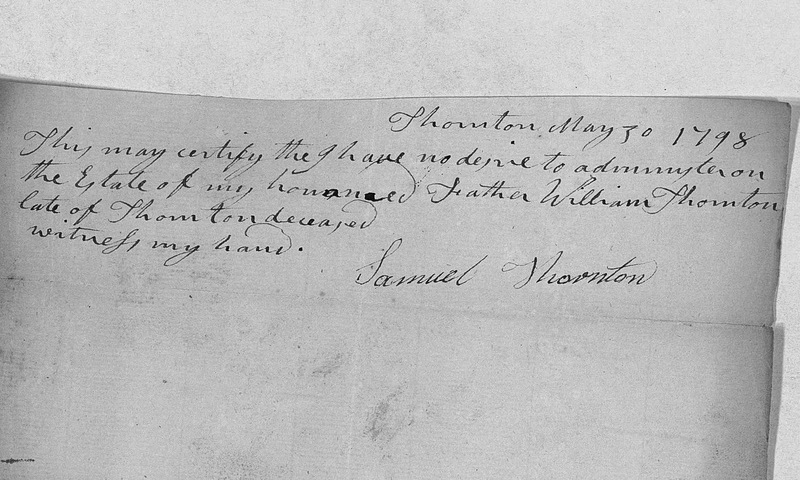 According to everything I have read, my Thornton line descends from James Thornton, father of Matthew the signer of the Declaration of Independence, through his son Samuel. The line went: James, Samuel (1), Samuel (2), Samuel (3), John, Paul, my father. My problem was finding any kind of documentation on Samuel (1). In one of my many posts on my Thornton ancestors I speculated that the real father of Samuel (2) was not Samuel (1) but rather his brother William. Today, I believe that I have found the documents which prove this relationship. While looking at the probate records from Thornton, New Hampshire, I checked the probate of William and there it was. The document was one in which the heirs of William Thornton acknowledge receipt of something or other and it was signed by William's children: Samuel, Dorcas and William. Dorcas, who later became Dorcas Durgin, has long been believed to also be a child of Samuel (1). Yipee! Samuel is the son of William. I will, of course, be posting much more about this discovery, but I was so excited by this finding that I had to put it into writing immediately. A few months ago I submitted a YDNA kit from my father to familytreeDNA.com for testing. I have been anxiously awaiting the results and they have finally arrived. We are descendants from a race of space aliens with a superior intellect. Actually we are just what I thought, a bunch of Brits, recently transplanted to the North American continent. Our haplogroup is R1b1a2, this group is found predominantly in France, England, Ireland, and Wales. In a comparison chart on the website of all Thornton's who have had their YDNA tested we fall into a unmatched category. Interestingly, the Thornton's in Virginia and other southern states are mostly of a different group, I1 which ended up in Scandinavia. What I need is for Thorntons who claim descent from James Thornton of Ireland, the father of Matthew Thornton, signer of the Declaration of Independence, to have their DNA tested. There are some southern Thorntons who claim descent from Samuel Thornton, son of James, and brother of Matthew. They think he migrated to the south and lived in South Carolina. This is the same Samuel who we say is our ancestor and that he lived in New Hampshire with the rest of his family. A DNA test will not give you a list of ancestors but it can point you in the right direction. If a southern Thornton thinks they're are part of the New Hampshire family a DNA test could prove it. If you are a Thornton and have a few spare dollars, the Thornton DNA project could sure benefit from your DNA test.